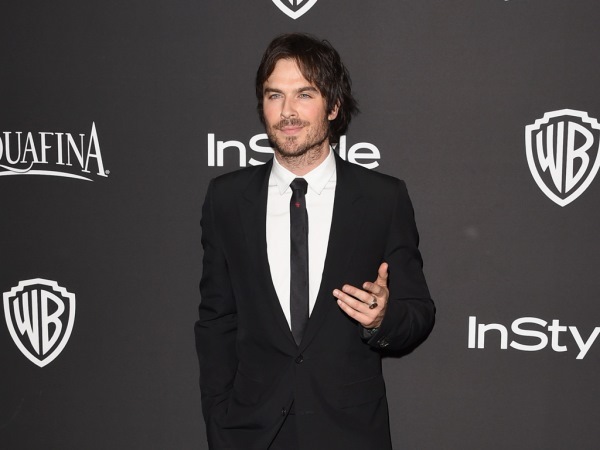 Ian Somerhalder is convinced people do “pretty gnarly stuff” after experiencing a breakup. The 36-year-old is making his directorial debut with Thursday night’s episode of The Vampire Diaries, a TV show in which he also stars as bloodsucker, Damon Salvatore. The instalment is filled with intense emotion and Ian, who split from co-star Nina Dobrev in May 2013, commiserated with the characters’ erratic behaviour. Fortunately Ian is now in a happy relationship with his fiancée, Nikki Reed. He absolutely loved being behind the camera for this episode, as the star didn’t find directing difficult in the slightest. "I am going to sound like such a prick right now, but actually nothing was challenging," Ian noted. "It wasn't challenging because—and that's the operative word, 'because'—I've been on this show for so long, I know it through and through. It's my baby, it's my heart and love. I've been living on this thing for six years of my life. Because I know the story very well, I know the actors very well and I know the crew very well, there weren't many steps that I didn't know. I took a lot of guidance from what I've learned from Peter Roth and Mark Pedowitz and [executive producers] Julie and Caroline [Dries] and our on-the-ground crew in Atlanta. "It is really exciting. It's a really cool thing to be able to do. I'm so thankful for the studio and the network and all of our producers and everyone who made this happen."